As to the right definition of religion, there is no convincing consensus among researchers over what constitutes a religion. Religion is defined as a cultural system of designated tenets, credo. practices, morals, holy texts, sanctified places of worship, prophecies, ethics, and organizations. It links humanity to supernatural, transcendental, or spiritual elements. relevant to a disciplined living. However. such practices vary from country to country and state to state within India, depending on the conviction and cultural fabric of the native communities. For any religion, certain simple tradition-bound rituals and practices are important as they promote self-confidence, peace of mind and trust in what one does. Such spiritual exaltation is essential for people who are leading a stressful life in this competitive world. Hence, chanting of mantras and pujas play a pivotal role in all places of Hindu worship and have positive elements. Swami Bodananda, the spiritual head of Samboth Foundation based in New Delhi, is of the view "the mental make up to sacrifice and surrender everything to God is necessary''. It implies a devotee must be ready to give anything to God. Equally important is the spirit with which it is done with dedication. 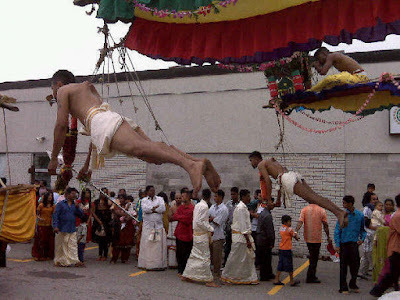 Parakkum Kavadi procession, observed that ''temple authorities should start thinking of giving up self-torturing faith based practices. After all no God is expecting from anybody to torture his own body for atonement.'' The ruling was made yesterday 11th February 2019. He also impressed on the temple authorities, ''What might have been relevant and consistent in ancient times need not necessarily have contextual relevance”. 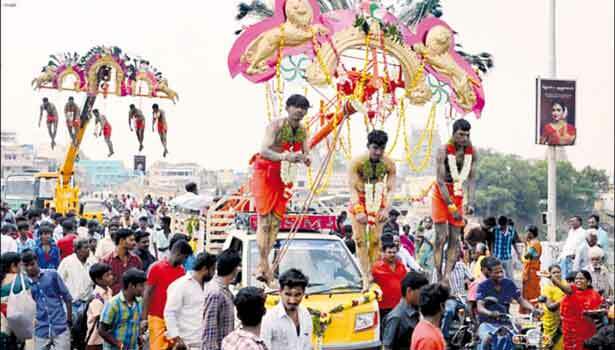 He further reiterated, ''The temple authorities and organizers of the function therefore should take the first step in this direction and bring about necessary awareness among those who perform Parakkum Kavadi to bring about a larger change". There are so many physical ways to achieve self-realization to control our mind and body as a way of meditating on God. Commenting on the self-torture Swami Bodananda Saraswati said, ''Rituals and offerings which hurt one's own self is not something the God wants," . Way back in May 2004 the Swamiji made a comment on the banned "thookam" ritual at the Puthenkavu Bhagavathy temple at Elavoor. This ritual is similar to Parakkum Kavadi of Tamil Nadu. Making reference to The Gita, the Swami said, "it hurts the Lord if one of his devotees is hurting himself''. Offerings are given to the Gods as an act of giving something that one loves to the loved ones, he says. "The origin of offerings for the Gods was sacred and beautiful, but human beings made them vile''. Self-torture is not a healthy way of expressing ones Bhakti or devotion. Nor does it give peace of mind or show the path to salvation. On the contrary, the pain one goes through will negate one' s full focus on god without any intervention.